According to NASA, the ozone hole reached its peak extent on Sept. 11, covering an area about two and a half times the size of the United States – 7.6 million square miles in extent - and then declined through the remainder of September and into October. NOAA ground- and balloon-based measurements also showed the least amount of ozone depletion above the continent during the peak of the ozone depletion cycle since 1988. NOAA and NASA collaborate to monitor the growth and recovery of the ozone hole every year. n 2016, warmer stratospheric temperatures also constrained the growth of the ozone hole. Last year, the ozone hole reached a maximum 8.9 million square miles, 2 million square miles less than in 2015. The average area of these daily ozone hole maximums observed since 1991 has been roughly 10 million square miles. 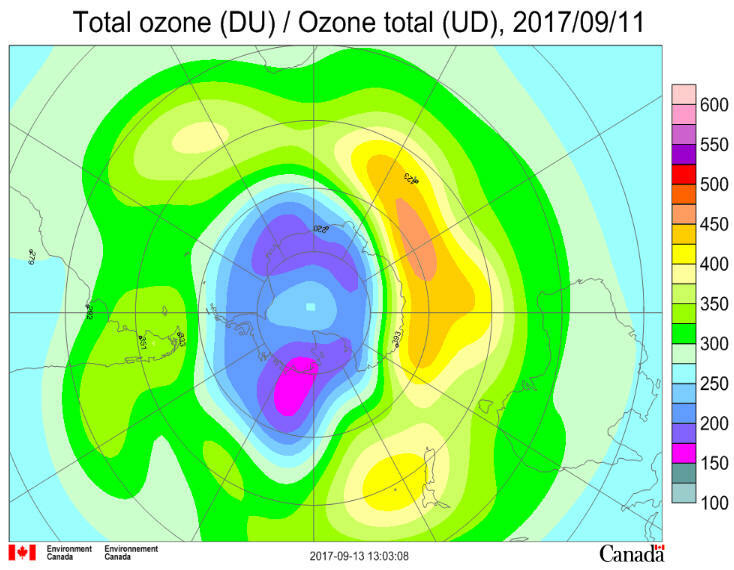 This year, the ozone concentration reached a minimum over the South Pole of 136 Dobson Units on September 25— the highest minimum seen since 1988. During the 1960s, before the Antarctic ozone hole occurred, average ozone concentrations above the South Pole ranged from 250 to 350 Dobson units. Earth's ozone layer averages 300 to 500 Dobson units, which is equivalent to about 3 millimeters, or about the same as two pennies stacked one on top of the other. NOAA Office of Oceanic and Atmospheric Research, Boulder, Co.
Antarctic ozone today: The atmospheric circulation remains in its winter mode, with the polar vortex near its largest. Ozone amounts are increasing around Antarctica, whilst they are falling within the vortex. The growing ozone hole is centred over the South Pole. Ozone values over the bulk of the continent are between 190 and 270 DU, though higher over the coastal fringe opposite Australia. Over the southern ocean they rise to over 450 DU in places, particularly south of Africa and Australia. There are noticeable differences between the various satellite ozone measurements over Antarctica. Temperatures in the ozone layer have passed their winter minimum but it is still cold enough (below -78°C) for Polar Stratospheric Clouds (PSC) to form over much of the continent. Temperatures are highest around the outside of the polar vortex and decline towards the pole and towards the equator. They are generally a little above the normal. In the upper parts of the ozone layer they are rising. Ozone depletion will increase further over the coming weeks. The ozone hole is likely to become more elliptical in shape and affect the tip of South America over September 15 and 16. The 2017 ozone hole: The polar vortex formed over the winter, isolating the ozone layer over Antarctica. Stratospheric temperatures fell below -78°C through much of the ozone layer, leading to the formation of polar stratospheric clouds. Overall, meteorological conditions in the ozone layer were stable until early August, allowing colder than normal temperatures to persist. A short-lived minor warming took place around August 8, and overall temperatures are now a little warmer than the average of the last few decades. Ozone depletion is taking place in sunlit parts of the vortex and the ozone hole formed in early August over the base of the Antarctic Peninsula, in part assisted by dynamic forcing. Rothera station saw ozone hole values for the first time on July 15, and for a longer period in early August. The hole grew steadily and by early September had reached 20 million square kilometres in size, about the average for the past decade. Antarctic ozone today: The atmospheric circulation remains in its winter mode, with the polar vortex near its largest. Ozone amounts are growing around Antarctica, whilst they are lower within the vortex. The growing ozone hole is centred over the Weddell Sea. Ozone values over the bulk of the continent are between 220 and 340 DU, whilst over the southern ocean they rise to over 400 DU in places, particularly south of Australia. There are noticeable differences between the various satellite ozone measurements over Antarctica. Temperatures in the ozone layer are near their winter minimum and it is cold enough (below -78°C) for Polar Stratospheric Clouds (PSC) to have formed over much of the continent. Temperatures are highest around the outside of the polar vortex and decline towards the pole and towards the equator. They are generally a little above the normal. In the upper parts of the ozone layer they are beginning to rise. Ozone depletion will increase further over the coming weeks. The 2017 ozone hole: The polar vortex formed over the winter, isolating the ozone layer over Antarctica. Stratospheric temperatures fell below -78°C through much of the ozone layer, leading to the formation of polar stratospheric clouds. Overall, meteorological conditions in the ozone layer were stable until early August, allowing colder than normal temperatures to persist. A short-lived minor warming took place around August 8, and overall temperatures are now a little warmer than the average of the last few decades. Ozone depletion is taking place in sunlit parts of the vortex and the ozone hole formed in early August over the base of the Antarctic Peninsula, in part assisted by dynamic forcing. Rothera station saw ozone hole values for the first time on July 15, and for a longer period in early August. See the final situation report for last year for information on the 2016 - 2017 season. Notes: An ozone hole is defined as an area with values below 220 Dobson Units (DU). On average a column of air will hold 300 DU of ozone, equivalent to 3mm of ozone at sea-level pressure. Most of the ozone is between 10 and 40 km with a peak at around 20 km. The Antarctic ozone hole is usually largest in early September and deepest in late September to early October. September 16 is world ozone day, and in 2009 the final UN Member State to ratify the Montreal Protocol signed up. All 197 Member States have now ratified the protocol up to and including the Beijing amendments. 2007 was the International Year of the Ozone Layer. Prior to the formation of ozone holes, Antarctic ozone values were normally at their lowest in the autumn (ie March). 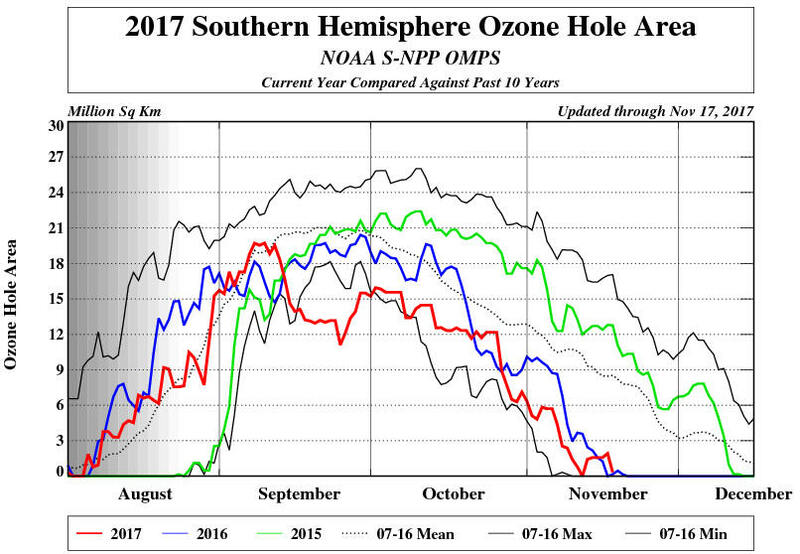 On occasion atmospheric vertical motions create small areas with ozone substantially below the long term average. Different satellites give different views of the exact ozone distribution. The continent covers 14 million sq. km. A summary of the WMO/UN 2014 Ozone Assessment, the Assessment for Decision-Makers was released on 2014 September 10. 2017 is the 30th Anniversary of the Montreal Protocol. Antarctic ozone today: The atmospheric circulation is in its winter mode, with the polar vortex building in strength. Ozone amounts are growing around Antarctica, whilst they are lower within the vortex. Ozone hole values were seen for the first time at Rothera on July 15. 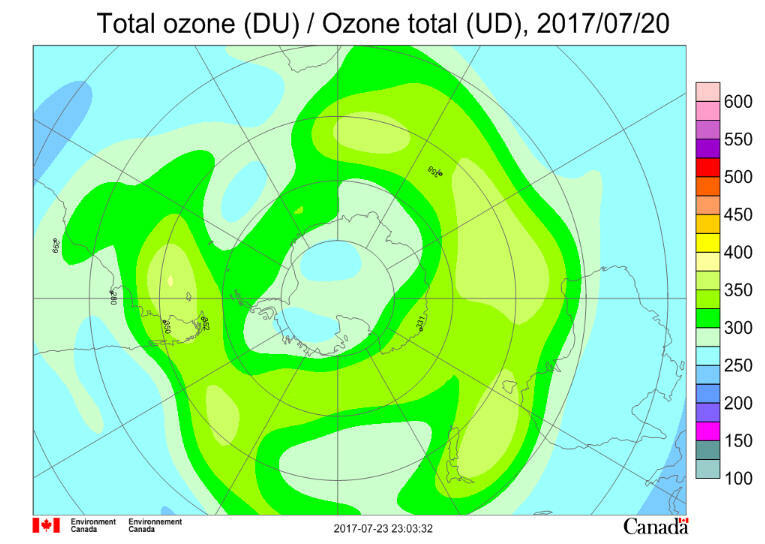 Ozone values over the bulk of the continent are between 220 and 310 DU, whilst over the southern ocean they rise to nearly 400 DU in places. There are noticeable differences between the various satellite ozone measurements over Antarctica. Temperatures in the ozone layer are nearing their winter minimum and it is cold enough (below -78°C) for Polar Stratospheric Clouds (PSC) to form over much of the continent. Temperatures are highest around the outside of the polar vortex and decline towards the pole and towards the equator. They are generally below the normal and towards the lower extreme of the range over the last 35 years. Ozone depletion is expected to increase over the coming weeks. The 2017 ozone hole: The polar vortex has formed over the winter, isolating the ozone layer over Antarctica. Stratospheric temperatures have fallen below -78°C through much of the ozone layer, leading to the formation of polar stratospheric clouds. Overall, meteorological conditions in the ozone layer are stable, allowing colder than normal temperatures to persist. Ozone depletion is beginning to take place in sunlit parts of the vortex. Rothera station saw ozone hole values for the first time on July 15. Antarctic ozone today: The circulation is settling into its winter mode, with the polar vortex building in strength. Ozone amounts are growing around Antarctica, whilst they are lower within the vortex. 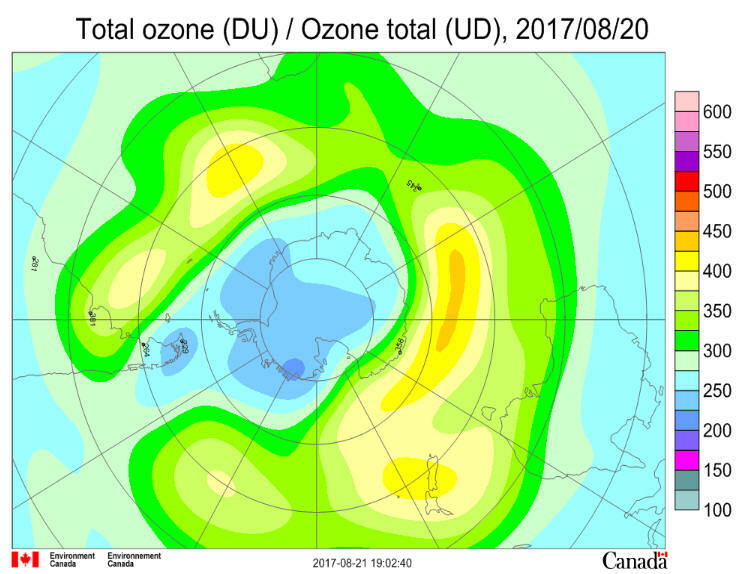 Ozone values over the bulk of the continent are between 240 and 320 DU, whilst over the southern ocean they rise to around 360 DU in places. There are noticeable differences between the various satellite ozone measurements over Antarctica at the moment. Temperatures in the ozone layer are cooling towards their winter values and it is now cold enough (below -78°C) for Polar Stratospheric Clouds (PSC) to form over much of the continent. Temperatures are highest around the outside of the polar vortex and decline towards the pole and towards the equator. They are generally close to or a little below the normal. The 2017 ozone hole: The polar vortex has formed over the winter, isolating the ozone layer over Antarctica. Stratospheric temperatures have fallen below -78°C through much of the ozone layer, leading to the formation of polar stratospheric clouds. Ozone depletion is beginning to take place in sunlit parts of the vortex.